Corrosion is recognized as one of the most serious problems in our modern societies and the resulting losses each year are in the hundreds of billions of dollars. Cost of corrosion studies have been undertaken by several countries including, the United States, the United Kingdom, Japan, Australia, Kuwait, Germany, Finland, Sweden, India, and China. The studies have ranged from formal and extensive efforts to informal and modest efforts. The common finding of these studies was that the annual corrosion costs ranged from approximately 1 to 5 percent of the Gross National Product (GNP) of each nation. A recent report describes the annual direct and indirect costs of metallic corrosion in the United States and preventive strategies for optimum corrosion management. The total direct cost of corrosion is estimated at $276 billion per year, which is 3.1 percent of the 1998 U.S. gross domestic product (GDP). This cost was determined by analyzing 26 industrial sectors, in which corrosion is known to exist, and extrapolating the results for a nationwide estimate. 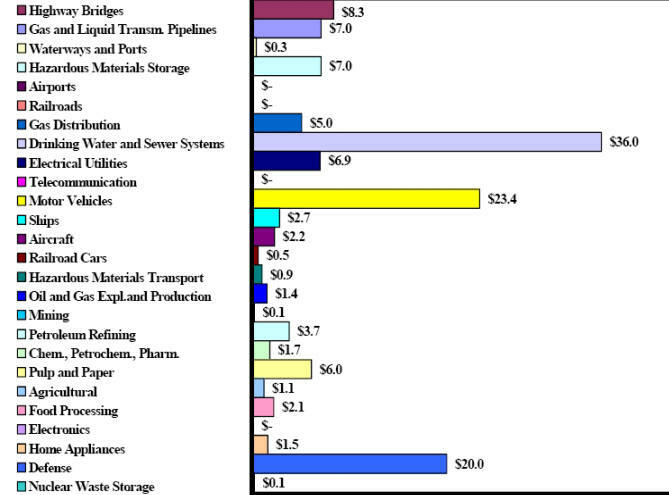 The sectors were divided among five major categories. The indirect cost of corrosion was conservatively estimated to be equal to the direct cost (i.e., total direct cost plus indirect cost is six percent of the GDP). Evidence of the large indirect corrosion costs are lost time, and thus lost productivity because of outages, delays, failures, and litigation. It was found that the sectors of drinking water and sewer systems ($36 billion), motor vehicles ($23.4 billion), and defense ($20 billion) have the largest direct corrosion impact. Within the total cost of corrosion, a total of $121 billion per year is spent on corrosion control methods and services. The current study showed that technological changes have provided many new ways to prevent corrosion, and the improved use of available corrosion management techniques. Advance corrosion technology through research, development, and implementation.